[The] story of one man's mathematical obsession, and a celebration of the human spirit and the scientific method. It is also a gripping intellectual thriller in which humanity, facing extermination from all-but-omnipotent aliens, the Grand Galactics, must overcome differences of politics and religion and come together . . . or perish. In 1637, the French mathematician Pierre de Fermat scrawled a note in the margin of a book about an enigmatic theorem: "I have discovered a truly marvelous proof of this proposition which this margin is too narrow to contain." He also neglected to record his proof elsewhere. Thus began a search for the Holy Grail of mathematics--a search that didn't end until 1994, when Andrew Wiles published a 150-page proof. But the proof was burdensome, overlong, and utilized mathematical techniques undreamed of in Fermat's time, and so it left many critics unsatisfied--including young Ranjit Subramanian, a Sri Lankan with a special gift for mathematics and a passion for the famous "Last Theorem." When Ranjit writes a three-page proof of the theorem that relies exclusively on knowledge available to Fermat, his achievement is hailed as a work of genius, bringing him fame and fortune. But it also brings him to the attention of the National Security Agency and a shadowy United Nations outfit called Pax per Fidem, or [i.e., translated, perhaps misleadingly, as] Peace Through Transparency, whose secretive workings belie its name. Suddenly Ranjit-together with his wife, Myra de Soyza, an expert in artificial intelligence, and their burgeoning family-finds himself swept up in world-shaking events, his genius for abstract mathematical thought put to uses that are both concrete and potentially deadly. Signals are received: a crude depiction of creatures pantomiming the destruction of the universe. Soon after, scientists note unusual radiation from an abandoned Earth-orbital observatory. When investigators board the observatory, they are taken prisoner. An unsuspecting Earth has just become part of a vast interstellar war. The discovery of another habitable world might [… save] the … power blocs of the resource-starved 21st century; but … arriving on Jem … they … export their rivalries. Subtitled, with savage irony, "The Making of a Utopia," Jem is one of Frederik Pohl's most powerful novels. Man Plus, winner of the Nebula Award, is the story of how a man undergoes a physical transformation in order to adapt to life on Mars. His cyborg makeover leads him to question the nature of humanity. First published in 1976, it remains relevant in today's ever-changing technological world. 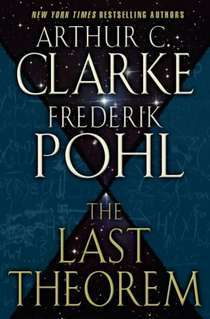 THE LAST THEOREM grew from 100 pages of notes Arthur C. Clarke gave to Frederik Pohl. [...] With the help of Elizabeth Anne Hull, Pohl completed a story of mathematics, political intrigue, and a threat to the survival of Earth. Latest novel in the Heechee series (New York: Tor, 2004). "Pohl at the top of his form"
A brilliant handling of the SF themes of first contact, planetary disaster, and future politics. The making of a cyborg, with added twists in the human/machine relationship.